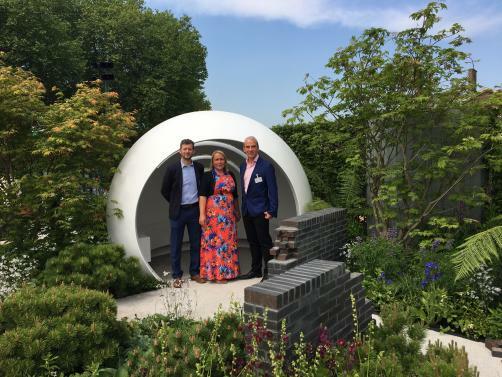 Mike Elliott, Vice President of Medical Affairs at Gilead (pictured, right), chats about the company’s sponsorship of a 'A life without walls' at the annual Chelsea Flower Show in London last week – a garden dedicated to combating the stigma surrounding HIV – as well as its rejuvenated efforts to cure the disease. It’s a partnership between us, Professor John Frater, and the Cherub Group, which is a collaborative group of five research centres. Their ongoing work is trying to get together some of the best minds in science to work both on HIV cure, but also reducing the stigma around HIV which exists, amazingly, even today in the UK. They came up with the great idea of raising awareness by using the Chelsea Flower Show – a popular, major event on the English calendar – and using a garden to deliver their messages and make some points about HIV. They asked us if we’d like to support it, and we want to work in as many ways as possible to support the research side, but also to raise awareness about the challenges for people living with HIV today. Can you give us a picture of the garden and what it represents? The way they designed it was to have certain areas of the garden representing different stages of the journey with HIV, and some of the challenges but also some of the opportunities. The white pod at the top of the garden is young people attending clinics, and in clinics you can feel very safe of course from the outside world. Then there’s a journey through the garden with obstacles along the way – some darker elements that show the difficulties – and then with the open seating area at the end of the trial, people will hopefully feel happy and confident. How is that consistent with Gilead? We’ve been working in HIV for almost 30 years now, since the company began, and we’ve been through the ups and downs of different therapies and the challenges that people around the world face, and I hope we’ve done our part to get involved in that journey for people living with HIV, and for the researchers trying to improve things. What do you hope the project will tangibly achieve? First of all, the garden will be stunning and compelling even without the story, so people will stop and look, and as you always do, whether it’s a piece of art of a garden at the Chelsea Flower Show, they’ll start to explore and find out what it’s about. So I hope each individual will go away with a different outlook on the world of HIV and an understanding of the challenges. People who write about such things, whether they are journalists or people who use Twitter, Instagram or other social media, will make comments about it, and whatever those comments are they will be raising awareness. Hopefully we will sustain that energy once the show has finished, and we’ll be able to bring some great stories that will maintain that continued awareness. What other similar projects is Gilead involved in or planning? We do a lot of projects. There’s one we’ve been doing in recent months called ‘HIV is a part of me’; the overall theme of that is that people live with HIV, it’s a part of them and it’s a part of their normal lives – coming to terms with that and living with that is very important. Another one, related to empowering patients, that we recently launched in the UK is ‘Treating me right’, and that focuses on how patients really want to be part of all of their treatment decisions and how they’re managed by the health system, but also how they live with their HIV. We certainly don’t believe we’re the experts in everything; we always refer to the community for what will be the best places for us to sponsor awareness activities. We do many of those; we have a grant in process in that does that. We work very closely with the community to try and understand exactly where we can have the most impact. Gilead reinvigorated hopes for a HIV cure with the announcement that candidate GS-9620 had entered human trials. Can you tell us about the candidate and how it works? First of all, it’s really important to say that it’s a really tough path ahead and there’s no certainty, even if promising results spring up here or there – nothing will be easy about HIV cure. GS-9620 is coming through Phase 1, and you could say in simple terms that it’s an immune-stimulant to the HIV virus; all it does is push the virus out of the hidden reservoirs in the body to allow it to then be affected by the antiretroviral therapy. What we’d shown in the Phase 1 studies is that indeed if we can push the virus out and reduce it once it’s in the bloodstream, and reset, if you will, the steady state of the HIV virus. So we’re not talking yet about clearing the virus. The hope is that in the long term, once we optimise the therapy, that it might be something that makes HIV into a very chronic but insignificant disease that doesn’t need ongoing pills every day. That’s quite a long way away, but these first steps have shown that this is a valid approach. So what exactly makes GS-9620 such an exciting project? What could it mean for patients and the wider HIV space? It’s the first time we’ve shown we can reset the viral set point and have some sort of longevity to that activity. That’s interesting because many other approaches have tried and have not yet succeeded. For patients in the long-term it will potentially mean that after a course of injections, the amount and frequency of pills you need to take can be reduced, either significantly, which would be very good, or even totally. They are aspirations that are in the future, but it might make a significant difference for patients. Until this primary goal can be achieved, what other key avenues and developments is Gilead pursuing to improve treatment outcomes in HIV? We’re also looking at long-acting injectable antivirals that work on that as well, where giving an injection once every two months or maybe even three months is enough to keep the virus under control. Again, there are lots of hurdles ahead of that, but that might be preferable for patients having injections intermittently throughout the year rather than taking pills every day. We’re looking at multiple different approaches, recognising that the challenges are real. There’s always unmet medical need in HIV, even in a developed, sophisticated healthcare system. There are ill with co-morbidities such as renal disease or heart disease or bone disease who need a medicine that’s got a better safety profile that is easier to take with their existing illnesses, so we’re researching that. And then there are two groups of patients: those who present symptoms very late and are very sick, who need very potent but also well-tolerated therapies, and there are also patients at the other end who have had and failed multiple therapies and are really at the end of the road, so they need new classes of therapy or more potent therapies; we’re looking at all of those areas. Globally the biggest unmet is still in sub-Saharan Africa and Asia, and so we’re looking with our generic manufacturers at making our therapies available very quickly and at a very low cost, and so they can get to those patients where there is still unmet need. The prospect of eradicating HIV obviously has a lot of people very excited. But can you put into context where we are on that journey, and what more still needs to be done to reach that goal? I think we are starting on a journey with many researchers around the world working in collaboration. We’ve evaluated a lot of science preclinically and now we’ve started the clinical journey with Phase 1 studies. I think what’s need is for researchers to collaborate, but we also need support from the research and innovation arms of government’s around the world. We have a good environment for that in the UK with groups like the MRC, and the US and many other countries in Europe have good government investment in research. The crucial element is to never give up no matter how hard it is. Science and mathematics are advancing, so we just have to keep going.